Turns out that my Chromecast (v2) does this unless you turn off Guest mode. Mine didn’t broadcast SSID either, and used the same channel as my main WiFi. Not great. I had a similar problem and did a factory reset. When I started to set up the Chromecast again I had a screen that enables guest mode, I disabled guest mode and the Chromecast SSID disappeared. Seems to have cured the problem but time will tell. Ah, the guest mode is the issue. Makes sense. Disabled that and now I don’t have it broadcasting anymore. Thanks! Interesting article. Thank you for posting this. I have exactly the same problem with my Chromecast Audio, bought late 2015. Once set up, it continues to broadcast a strong signal on one wifi channel (currently channel 11, but I have seen it skip between channels 6 and 11). Unfortunately, the factory reset did not work for me, and after setting up afresh, my Chromecast Audio continues to broadcast, making my wifi network somewhat problematic (largely because my network is using channels 6 and 11 which are the best for me given the other wifi routers in neighbouring houses). Ah. Turns out that if you have guest mode switched on, it continues to broadcast its own wireless network. Turning off that option fixed it for me. I have 3 Chromecast (2 first gen and 1 second gen). All three exhibited the problem mentioned even after multiple factory resets. A call to Google tech support informed me that this behaviour is “normal Chromecast operation”. After some experimenting, I uncovered the solution mentioned by others, namely, disabling Guest mode. Thanks for posting this article. I should have read the comments before dashing off to try the factory reset procedure. Thanks I changed it to guest mode and I think it has fixed the issue. Thanks for your comments. My BT router all of a sudden started endlessly rebooting itself a few days ago. Even went as far as reporting a fault to the provider. As soon as I powered down the CC Audio, the router recovered and got us back on the internet. Problem I have now is that I can’t even log into the CC without the router rebooting itself (approx a minute after powering on the CC). Therefore I am unable to get as far as switching off guest mode. Any ideas? Similar problem here John – I’m on a homehub 5 with BT… I have 2 cc audio and 2 cc tv… last week there must have been an update as I woke up one morning and all internet access in the house was gone. Having experienced this problem once before, I went around the house and disable all the cc… turns out the TV pucks were fine, it was both audio pucks that were causing the problem. I have yet to find a way to get them back up and running even after multiple factory resets and disabling the guest mode during set up as as soon as it gets to the connecting wifi part, my whole net work goes down… and my bt hub is speifically set up on 2.4 and 5GHz simultaneously due to this issues happening last year with the TV one – both channels and the hard wired lan stop working before the set up can complete thus rendering setup impossible! Update – I found out this is a known issue specific to certain routers including several BT Homehubs in the UK… its a bad firmware update on the chromecast audio. The only way out of this is to get the chromecast to update to newer firmware (currently by joining the preview programme)… but to do this you have to get the device to connect to a DIFFERENT router… over on the google forums, many people are suggesting doing this at a friends house or using you phone as a hotspot. Also, once connected you may have to stay connected for up to an hour before the device decides to do its firmware update. Apparently, this has been happening since September but some people didn’t get the new firmware until November. Google has admitted the problem but has failed to tell BT as many users have had replacement hubs as a result of this as the engineers could not work out it was the chromecast causing the issue. Found this thread in late December, 2017, and it’s still relevant. 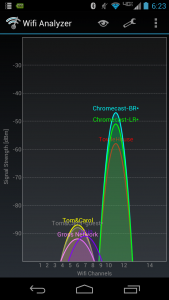 Our Chromecast device was interfering on the same channel as the WiFi router, but not broadcasting an SSID. Turning off its guest network did the trick. thanks! Hi, yes I just had this annoying issue trying to work out why this hidden SSID kept appearing in very high signal strength, it changes channels as you change your wifi router’s channel too. I am having the same issue as you and yet to find a resolution. I’m going to turn off all the cc and ca tomorrow to confirm this is the issue. They are all at the newest firmware and the preview program is the same as the production firmware. When I connect to the 5ghz, there’s no issue at all.